It's been over a year since Alien: Covenant split fans down the middle. The divisive film added way more back story to the mythology that's existed for almost 40 years. Upon the release, critical reception was stifled and the box office failed to reignite for Ridley Scott's latest entry in the long running franchise. Adding layers to the mystery of David and his evil creation, Covenant was hailed by some as a return to form and was completely hated by others. Due to the low ticket sales and what appeared to be flailing interest, the third chapter was put on hold. 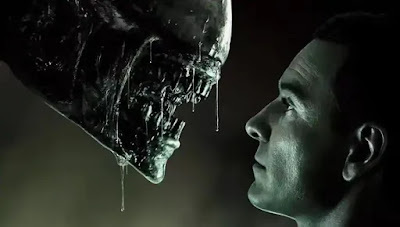 Now, Empire (via HnE) is reporting that the next movie, tentatively titled Alien: Awakening would have seen the Prometheus era connect to the original films. The on hiatus or paused project that's now owned by Disney would have seen the Engineers do battle with the android playing god. The script by John Logan is said to have seen David using the Xenomorphs as a militaristic order when the Engineers seek revenge for his genocide on their planet. Empire speculated that this movie would have seen the final connection and a return to LV-426 where the long awaited explanation of the crashed space craft would have finally received an explanation. And they also hinted that the Space Jockey may have been a hybrid version of David. At this point, we'll probably never know unless Disney decides it's a good time to try this again. But with faltering profits at the box office, they may not play their luck at this point.